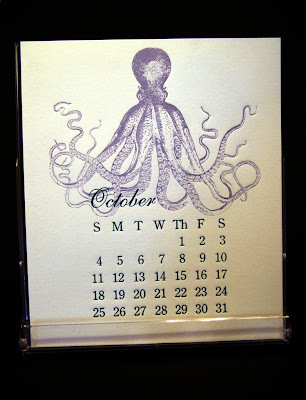 Joie Studio's 2009 Calendar in the LA Times Today!!! Oh boy oh boy oh boy! 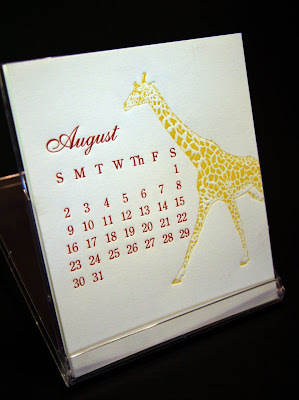 Joie Studio's 2009 Letterpress Desk Calendar is featured in the Home section of the Los Angeles Times today! It was very very exciting to go and get the paper from my doorstep this morning and open it up and see my very own creation staring back at me! I'm so excited! 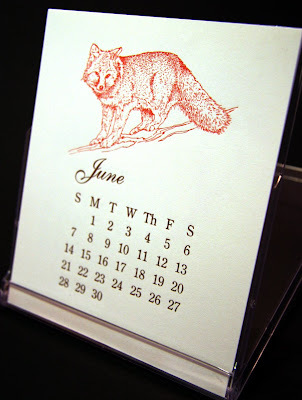 Check it out, and if you haven't gotten a calendar yet, go to Joie Studio's Online Letterpress Shop and pick one up! Congratulations, too, to Christine of Flora & Fauna (who we had the pleasure of meeting at Bazaar Bizarre in May) and Krank for their inclusion in the same article! 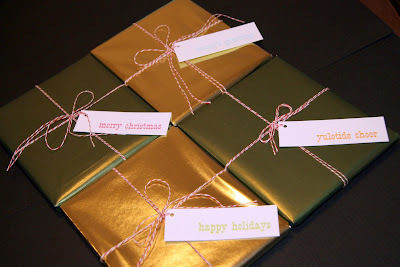 Okay, so today is Christmas eve, and I figure I would give my blog readers a little gift. Here is a video that I took recently of a print run of envelopes so you can see what the printing portion of letterpress entails. In this video (it's all of one minute, 46 seconds), you'll see me feeding envelopes into the press. It was actually a lot more effort than I thought it would be to take a video of myself. I had to find a tripod and set everything up so you can see what I'm doing. One of these days I'll do one where I'm actually talking, but for now, I hope you enjoy! What I'm printing are envelopes for a recent custom letterpress order for Bourbon Steak Washington, DC. The press is running at my "usual" speed, and every now and then, you'll see me use the throw-off lever to throw-off the impression - usually when I misfeed or I'm "off-time." The plate, in case you're interested, is a magnesium plate mounted on wood, and the ink is a metallic bronze color. The envelopes are a gorgeous gold metallic. Let me know if you have any questions! Happy holidays! 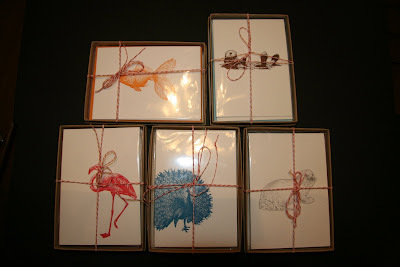 Last Minute Gifts...Joie Studio Style! 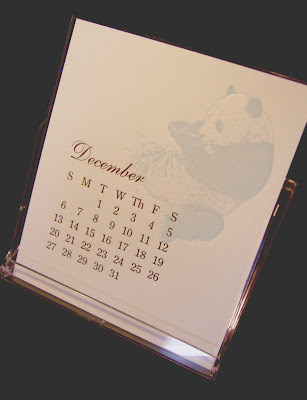 The calendars (gift wrap or no) are available in both the Joie Studio Letterpress Shop and the Joie Studio Etsy shop. If you're sending the box set as a gift, I can close it up for you and add a letterpress holiday tag for the finishing touch, like so! 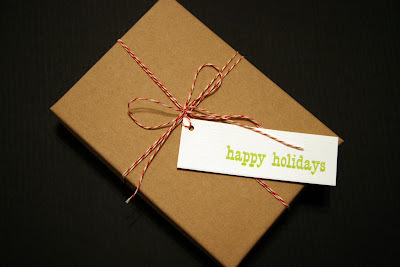 And, if you like the letterpress holiday tags, they are available all by themselves, in a variety pack of 4. I'm unsure I will reprint these, so get them while they're around! Survey: Which Animal is Next? Okay, so those of you who were at Felt Club and Bazaar Bizarre know that the baby monk seal is the next letterpress card in the Menagerie collection. 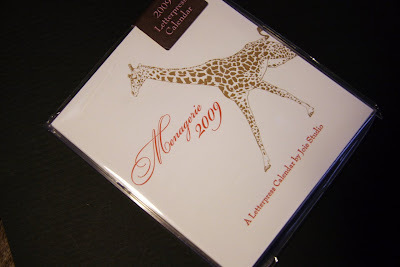 But we had so so many requests for other animals in the 2009 Menagerie desk calendar to be made into cards, coasters, etc. So I put a survey up on the right here on the blog for my readers to choose the next animal to get its own letterpress card. Let me know what y'all want to see next, and I'll get started! Democracy works - vote! Whew! We're back in Los Angeles! Bazaar Bizarre was a blast on Sunday! Thanks so much to the organizers for putting on such an awesome event. Dena and I had a blast in San Francisco! We went to the CLOCK BAR Saturday night, which, as you might remember, Joie Studio made the pre-opening reception invitations for, and had the most delicious truffle butter popcorn there. It's a super fun place right across from Union Square -- check it out when you get the chance!